Width - 72" Depth - 22.25" Height - 36. 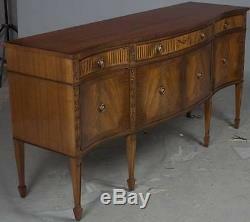 This very attractive serpentine sideboard was made in England sometime around 1960. It provides plenty of storage space via the spacious cabinets and three drawers and a gorgeous combination of mahogany wood with carved decorations. 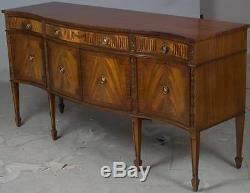 The tapered legs and serpentine shape of this buffet come together to give an overall Regency Period feel. Brass ring handles with plate backs further complete the look. Mahogany is the wood that was used to create this piece. 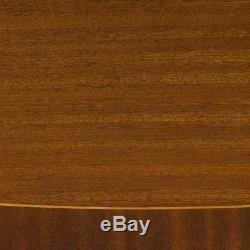 The overall color is a nice, deep brown accented with mahogany cross banding on the doors and drawers. 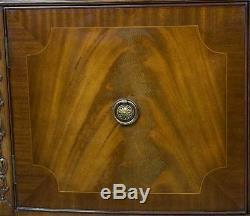 Accenting the serpentine shape around the top is another satinwood string inlay and mahogany cross band. All drawers were dovetail constructed and the left and right drawers have a felt lined bottom. Inside the cabinet doors are wooden shelves to help maximize storage space. All drawers and doors lock and three keys are included. 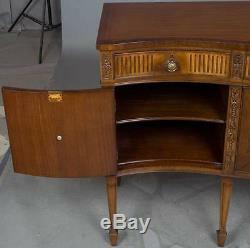 Overall this sideboard is in very good condition. There are some light surface marks to the bottom molding. 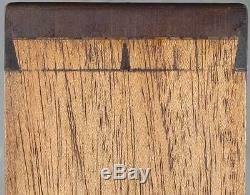 Notably, each drawer and cabinet face have developed some minor fading as evident in the pictures. Finally, the entire sideboard is sturdy, the drawers and doors work very easily, and it would make a useful and beautiful addition to your home! The item "Antique Style Serpentine Front Long Mahogany Sideboard Buffet Server Credenza FS" is in sale since Tuesday, May 23, 2017. 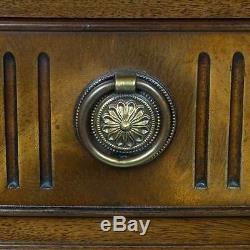 This item is in the category "Antiques\Furniture\Sideboards & Buffets\Post-1950".